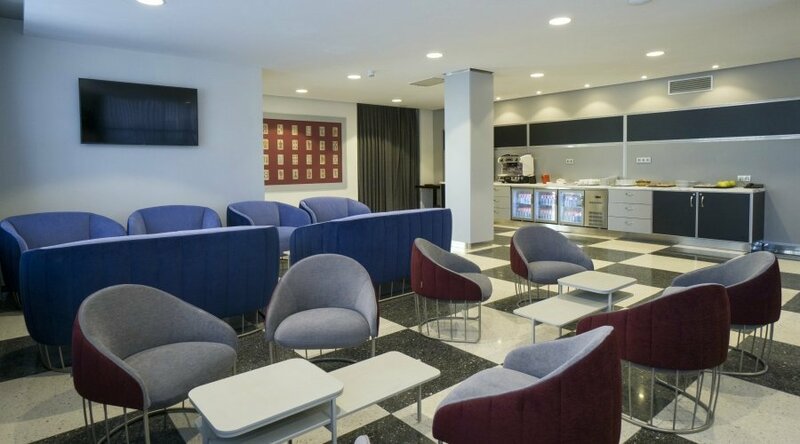 It is located a few meters from the airport. 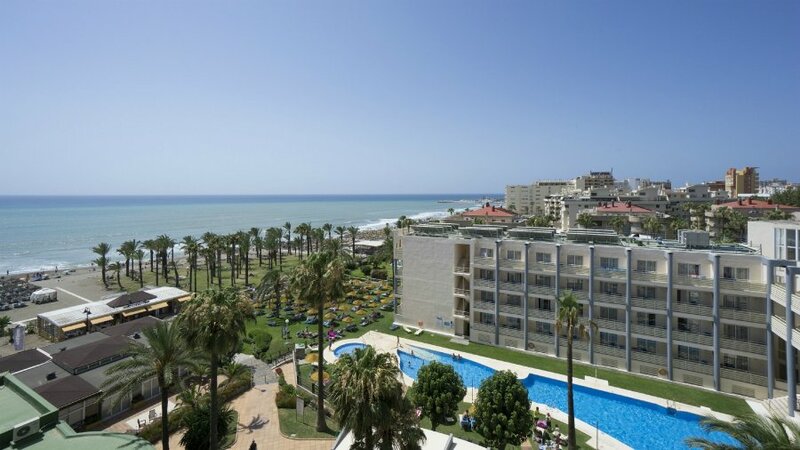 Take the train to Fuengirola, which runs every 30 minutes. 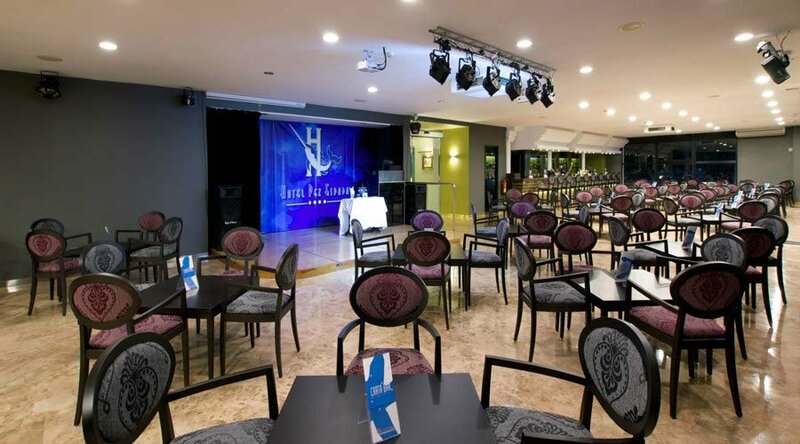 The station where you will have to get off to get to the hotel is El Pinillo. From there it is 1.2 km to the hotel. The journey is 15 minutes and the price of the ticket is 2.50 € per person approximately. 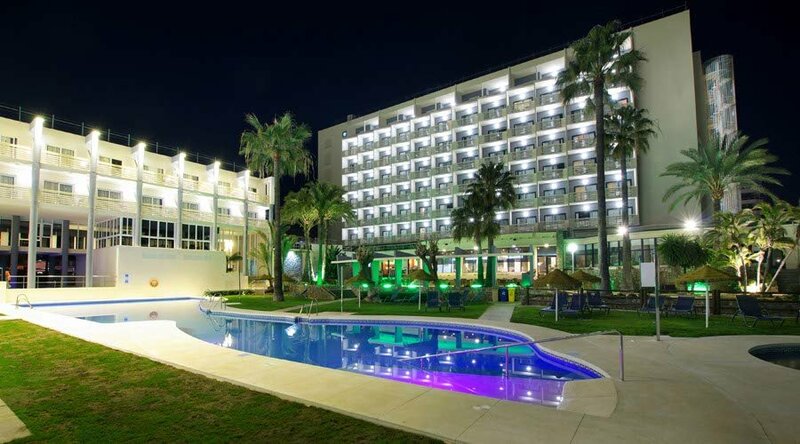 From the center of Torremolinos, you can take the 110/121 bus that will leave you at the roundabout of the Pez Espada, just a few meters from the hotel. 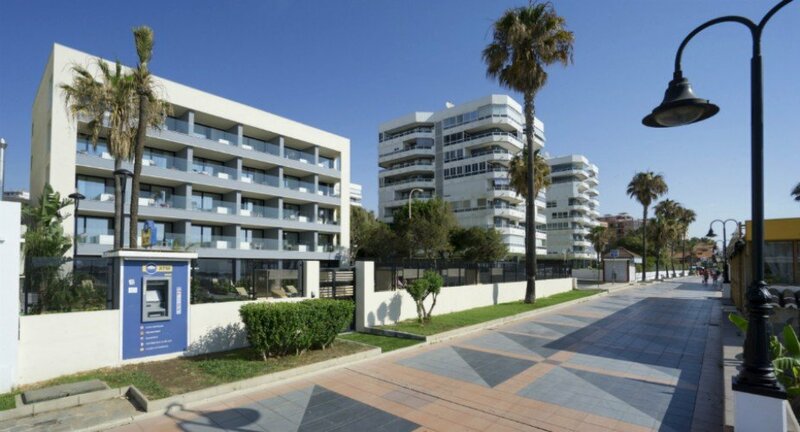 From the Airport: Take the N340 road towards Torremolinos - Benalmádena and do not leave this road until, on your right you see a CARREFOUR shopping center and later a REPSOL gas station. Please turn left at the next roundabout. 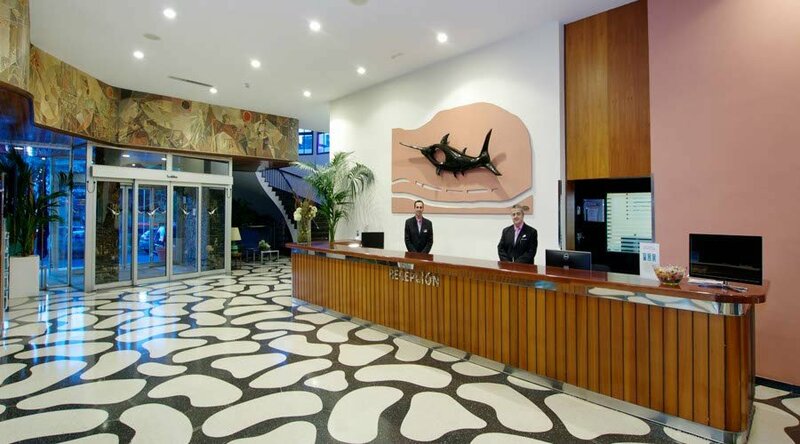 At the end of the street you will find a roundabout with a figure of a "Swordfish" that is just a few meters far from the hotel. 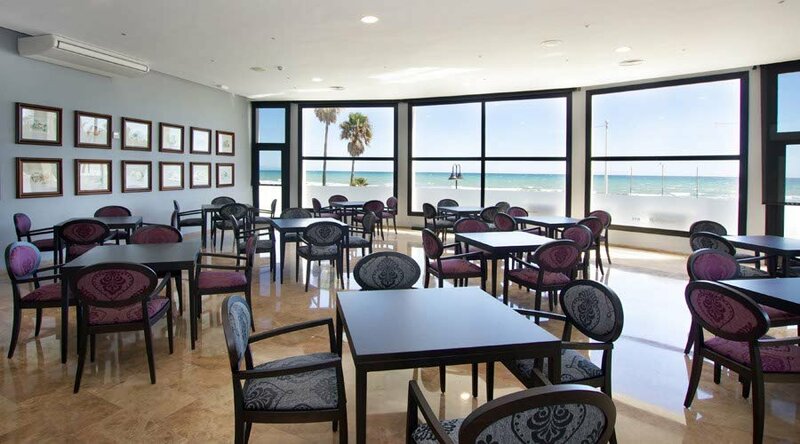 These rooms are in the main hotel building and offer views to the parking area and the quiet access that leads to the beach. 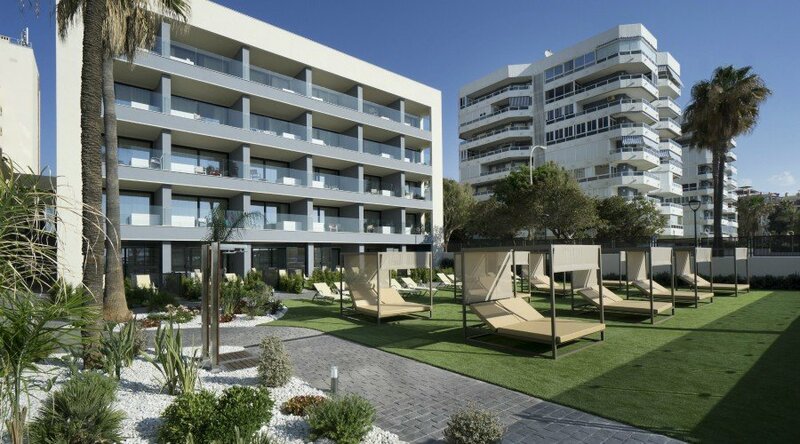 All rooms have a small balcony, two beds, flat-screen TV with interactive menu, Internet connection, air conditioning, optional minibar and safe deposit box, direct-dial telephone. 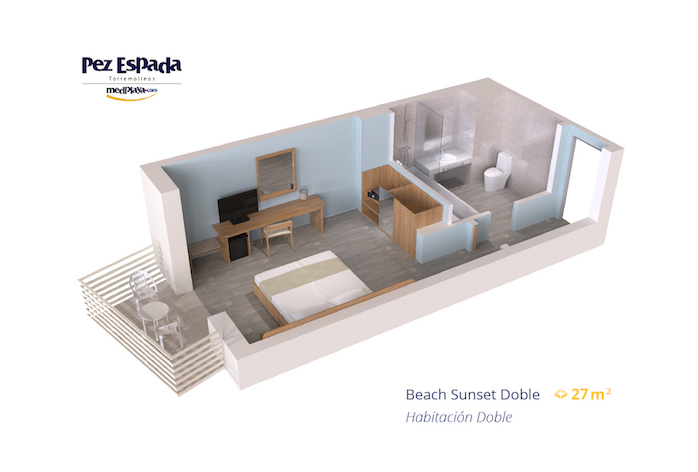 The spacious bathroom with exterior window has a bathtub with shower, hairdryer. 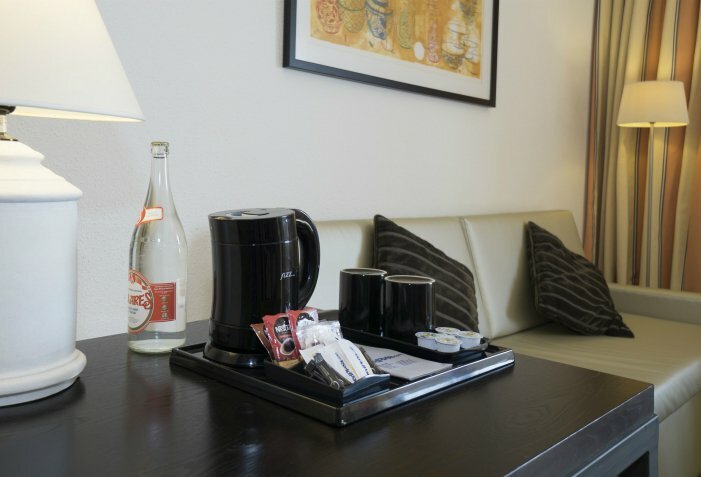 Kettle service provided in room free of charge. 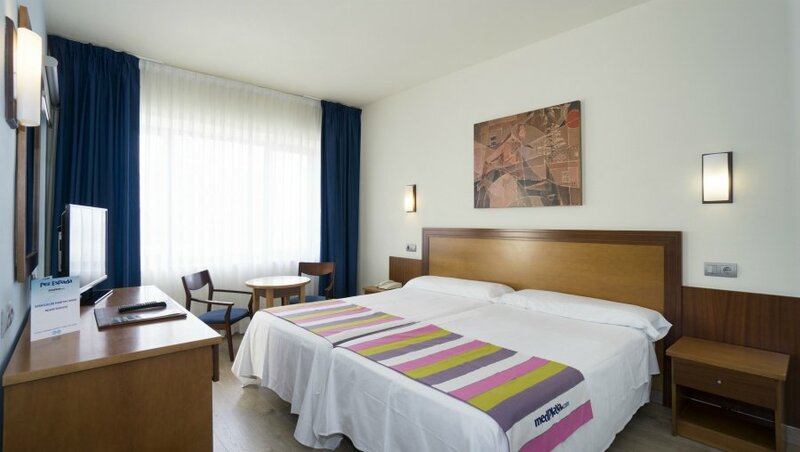 two twin beds; plasma TV with interactive menu; connection to the Internet; air conditioning, optional minibar and safety deposit box, direct telephone. 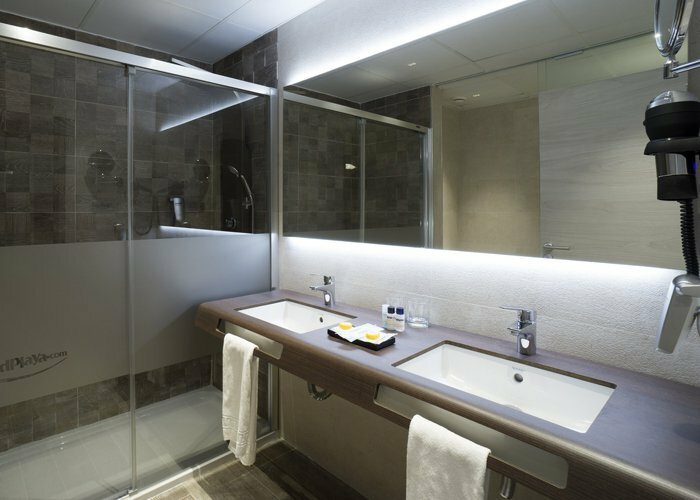 The bathroom is spacious and has a bath and shower, hairdryer, shaving mirror and a full complementary toiletry selection. 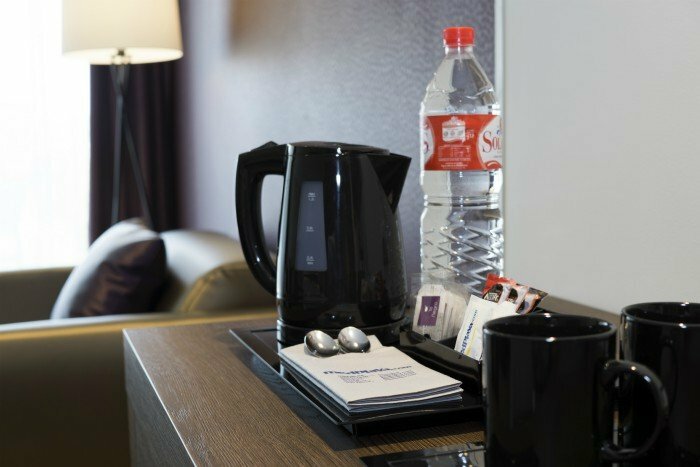 Kettle service provided in room free of charge. 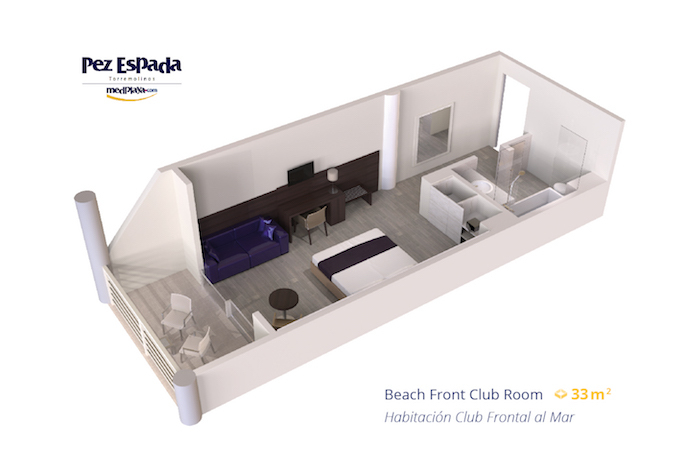 Our Beach Front Club Rooms are spacious rooms with a privileged situation, front view of the sea and the garden. 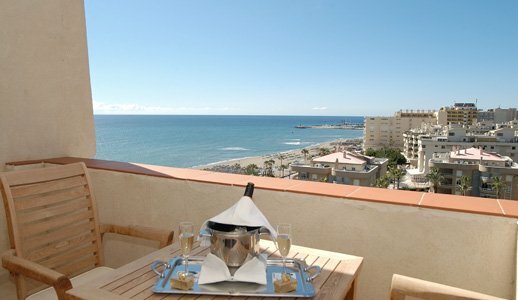 Large terrace with furniture with direct view of the promenade and the beach. 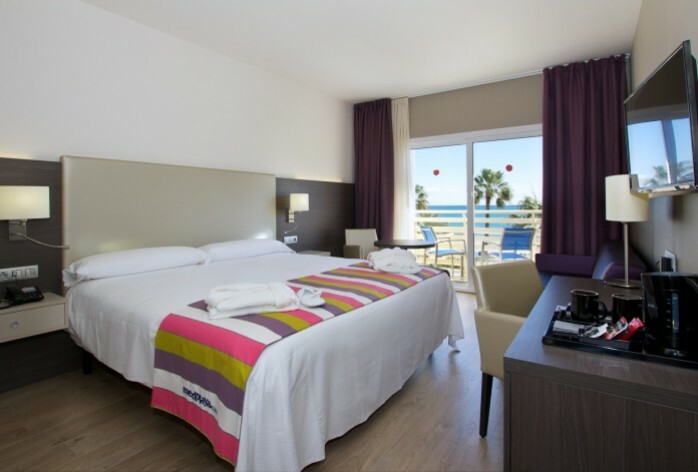 The Beach Front Club rooms are decorated in a modern and contemporary style, taking your comfort in mind. 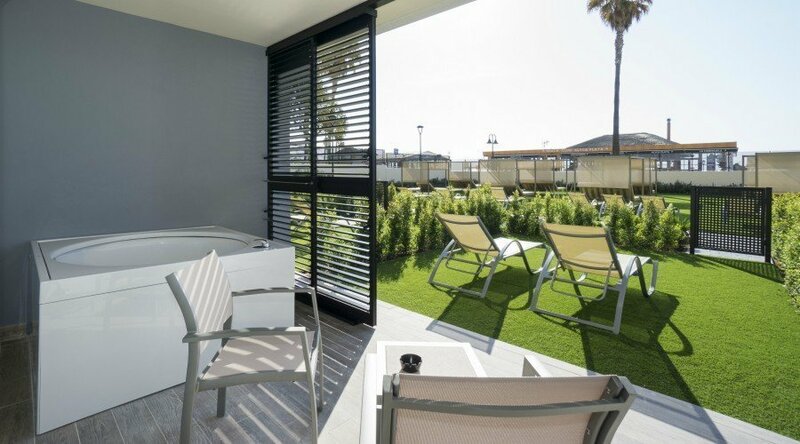 All rooms have a balcony with terrace furniture so you can enjoy the view from your room. 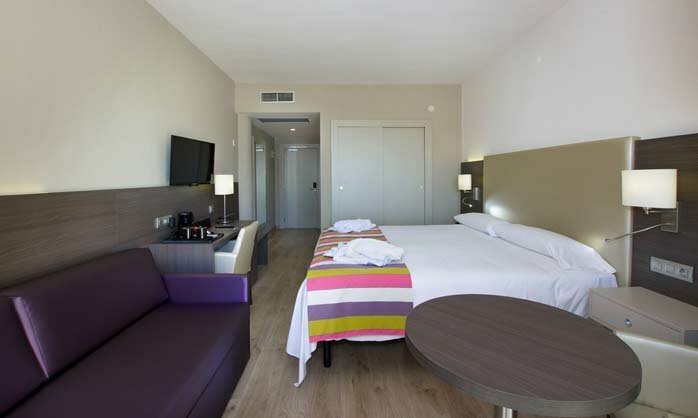 Double or twin beds with duvet: Plasma TV; Direct telephone, Wifi Premium. 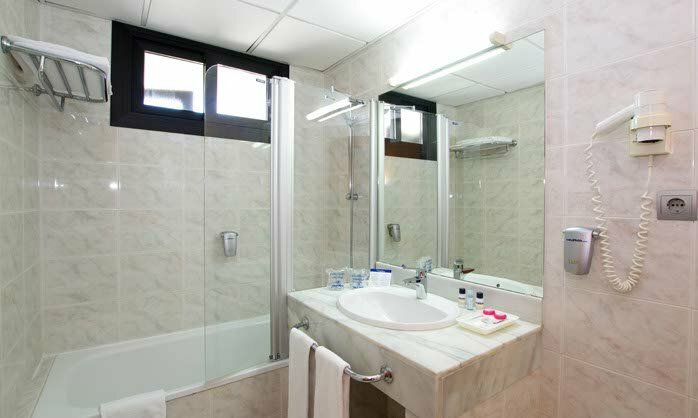 The bathroom is equipped with a bathtub with shower, hairdryer, magnifying mirror and a full selection of amenities. 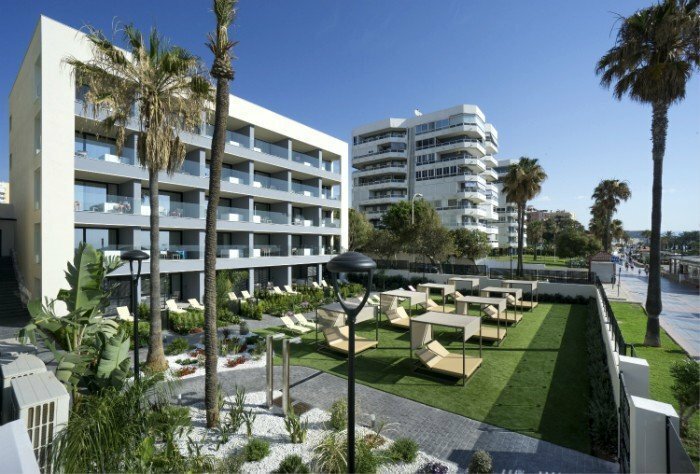 Services Club: minifridge (mini bar) with welcome drinks, tea / coffee making facilities, bottle of wine, Club amenities, safe, bathrobe and slippers, pool towels to be collected in Reception (refundable deposit of 20,00 €). 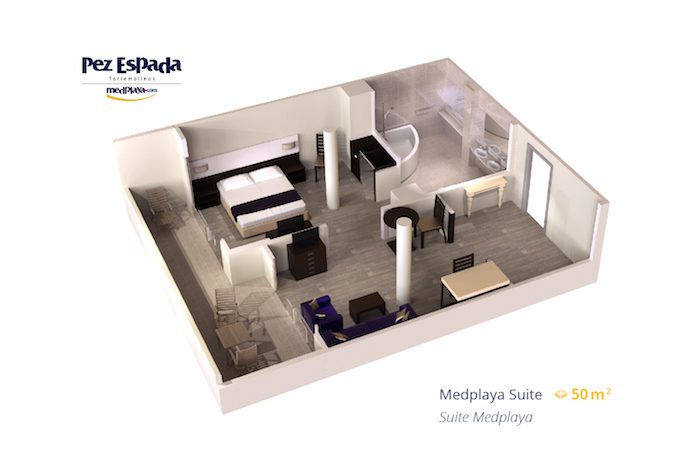 The MedPlaya Suites are very spacious rooms with a separate lounge, and are situated on the top floor of the hotel (7th floor). 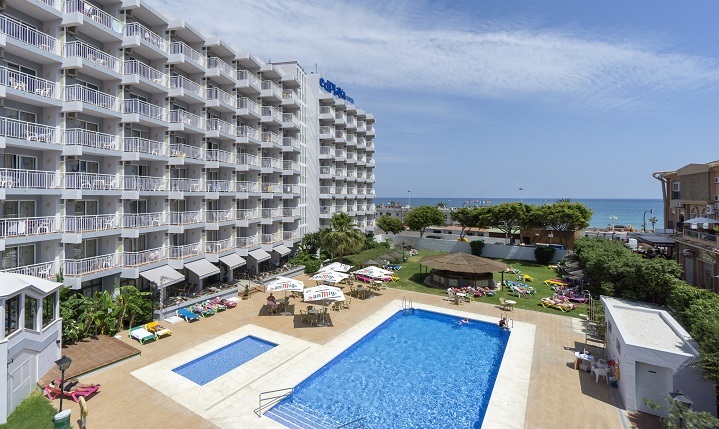 All suites have an amazing side view of the sea, the swimming pool area, and the hotel gardens. 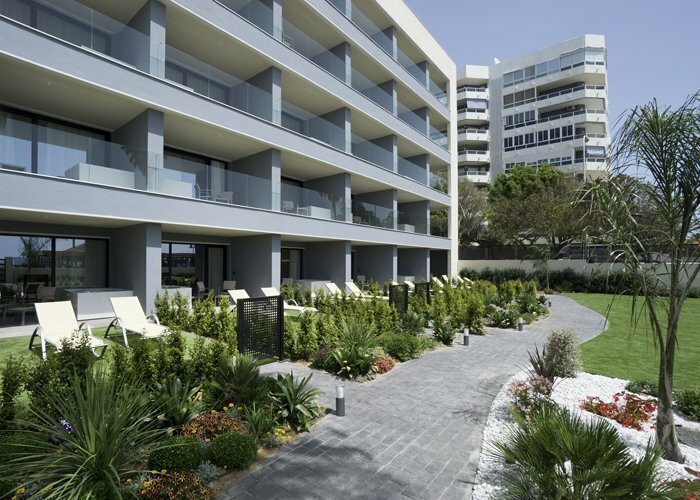 All suites have a large private terrace. 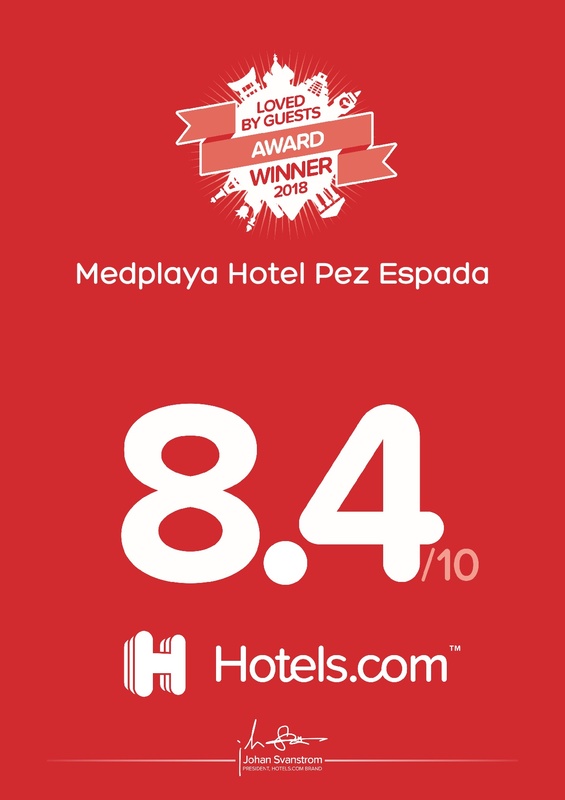 The MedPlaya Suites all have a king size bed (2 x 2 meters), comfortable sofa-bed in the lounge, two flat-screen TVs with interactive menus and internet connection, air conditioning and direct-dial telephone. 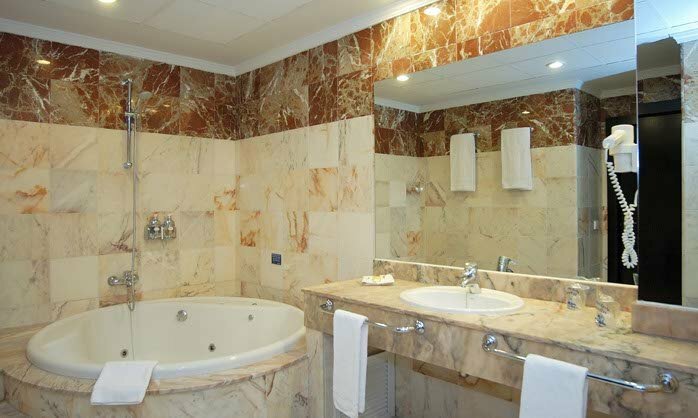 The bathrooms have a half circle bathtub and a separate shower area. 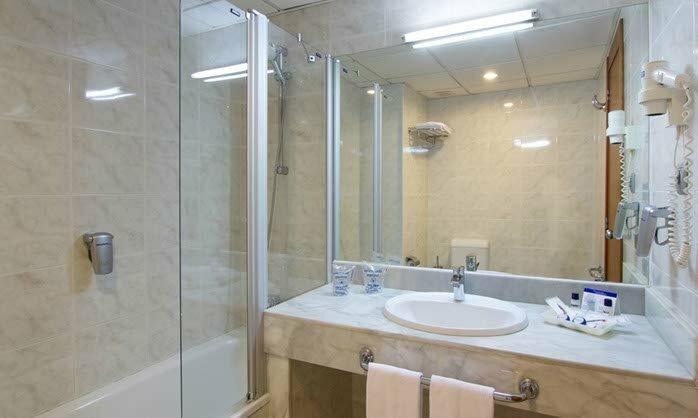 Bathrooms are fully equipped with hairdryer, magnifying mirror and a full selection of complementary toiletry items. 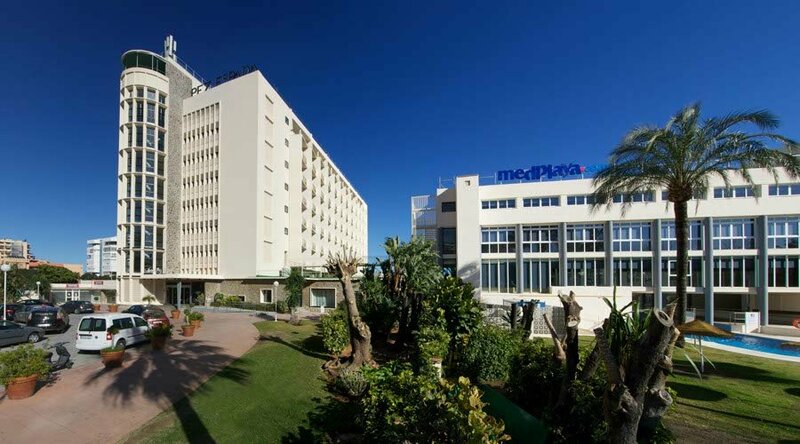 Included in the price of the MedPlaya suites is our Club service, which consists of: Fridge (mini bar) with welcome drinks, tea / coffee making facilities, bottle of wine, Club amenities, safety deposit box, bathrobe and slippers, pool towels to be collected in Reception (refundable deposit of 20,00 €). 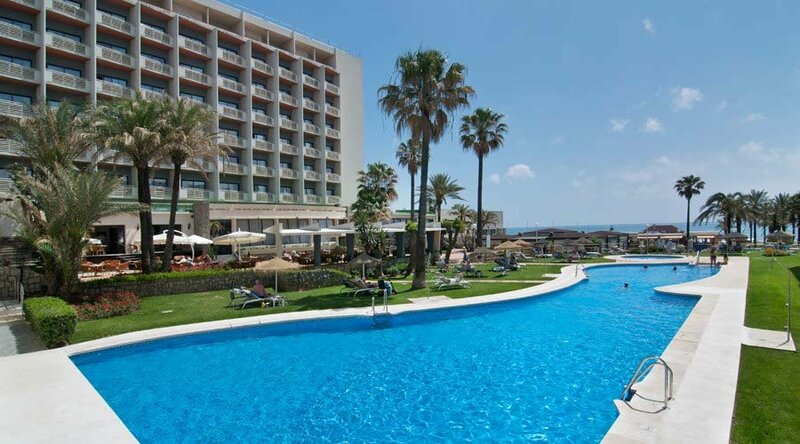 Our CLUB rooms in the Hotel Pez Espada are situated in the part of the hotel which has rooms with a lovely view of the pool and garden, and a view of the sea off to the side. 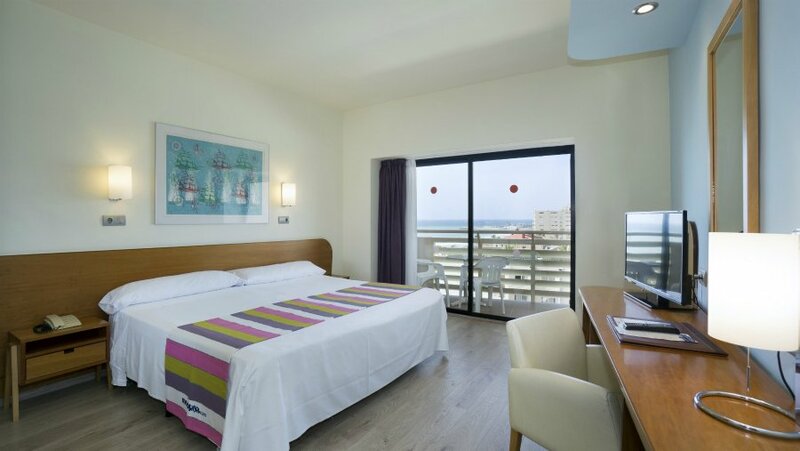 (Formerly our Beach Sunrise Double rooms). 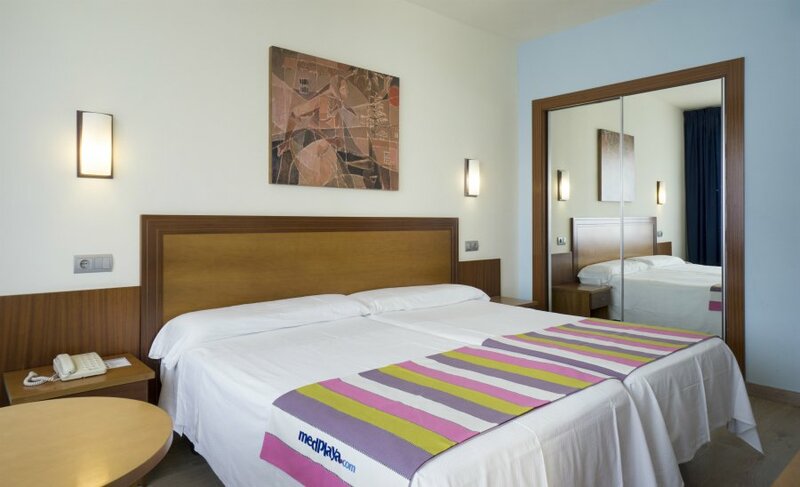 The Club rooms are furnished in a modern, contemporary style, with your comfort very much in mind. 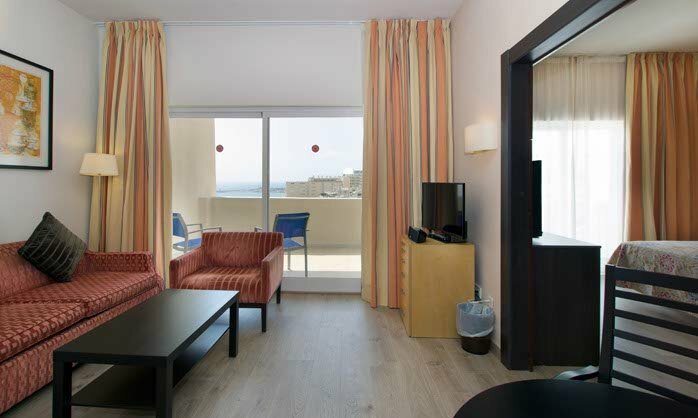 All rooms have a balcony with furniture so you can enjoy the views from your room. 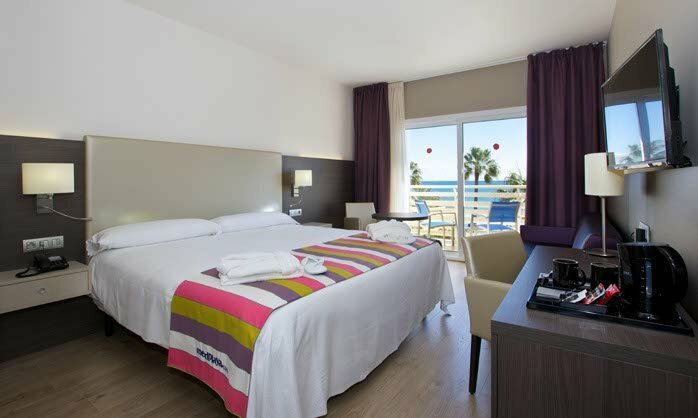 Double or twin beds with duvet: Plasma TV; direct telephone; Wifi. 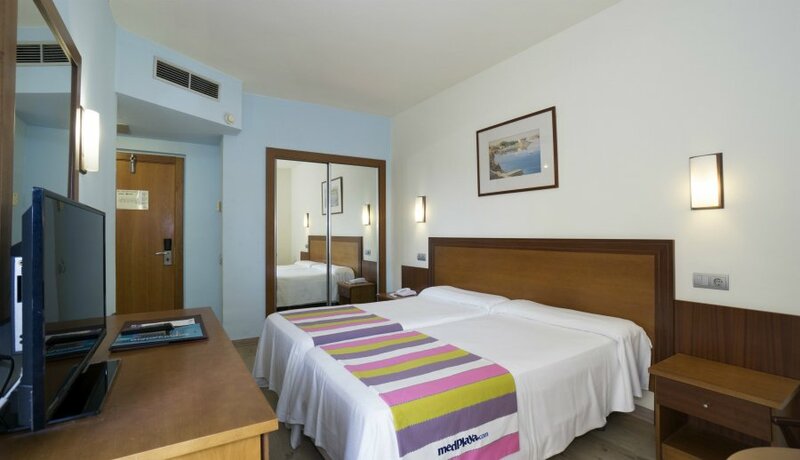 The bathroom is well equipped with a full bathroom comprising of bath with shower, hairdryer, shaving mirror and a full complementary toiletry selection. 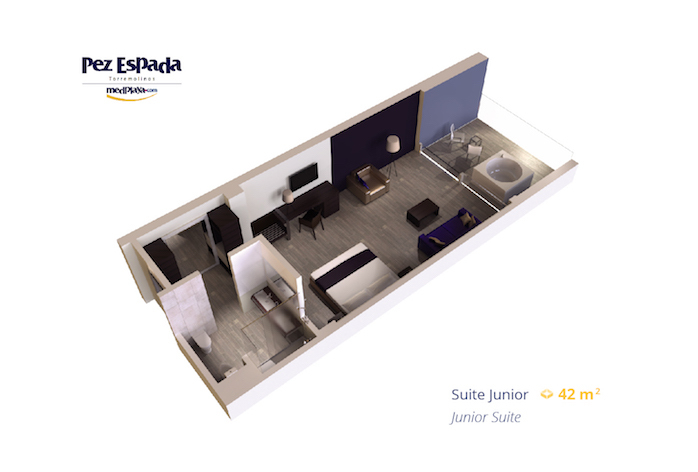 Our new Junior Suites provide another level of comfort for our guests to enjoy. 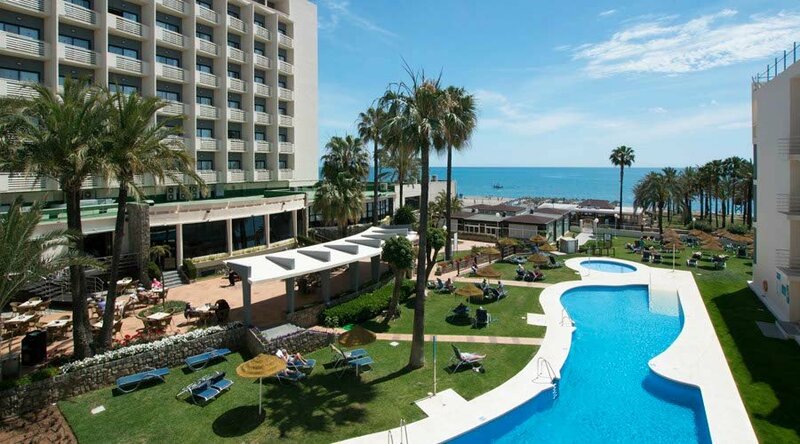 All the Junior Suites are facing straight onto the seafront of Torremolinos. 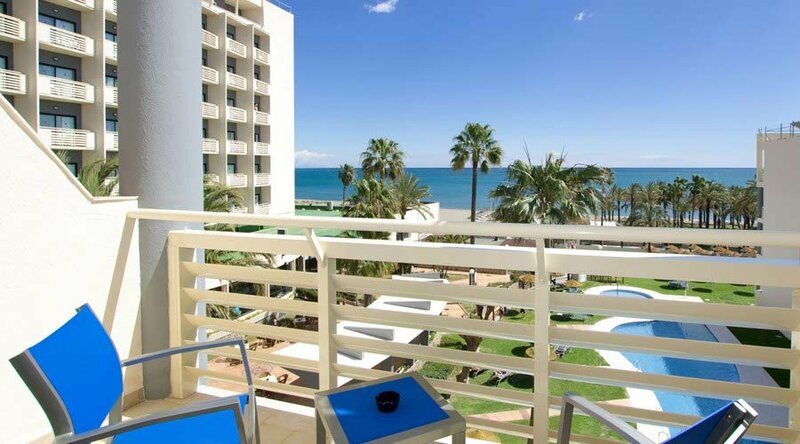 The ground floor Junior Suites have their own private terrace and the Junior Suites on the other four floors have balconies with direct views to the sea. 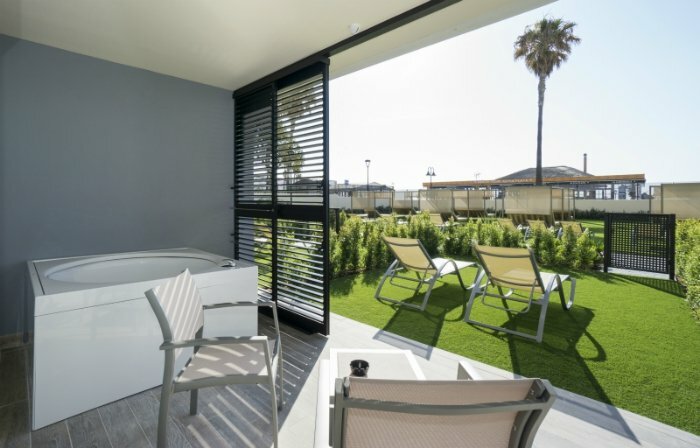 The Junior Suites are located in Pez Espada III, adjacent to the main building of the hotel, leading onto the seafront with its own garden and sunbathing area with sunbeds and Bali beds available. 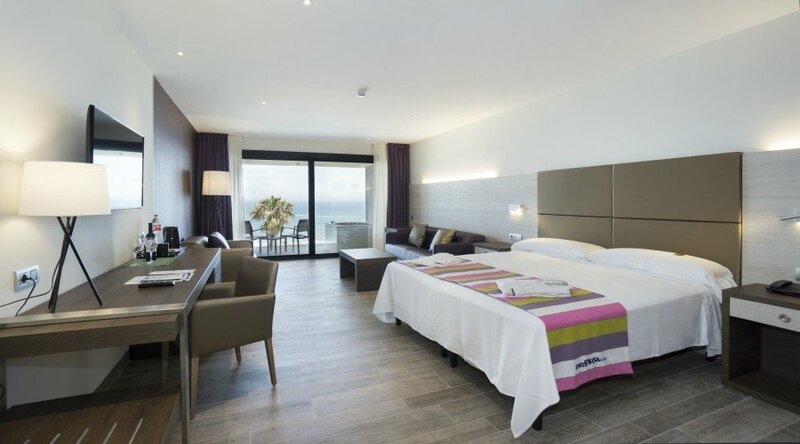 All Junior Suites are 42,50m2 in size and the balconies are 10.05m2 thereby providing a spacious and modern environment to enjoy your holidays. 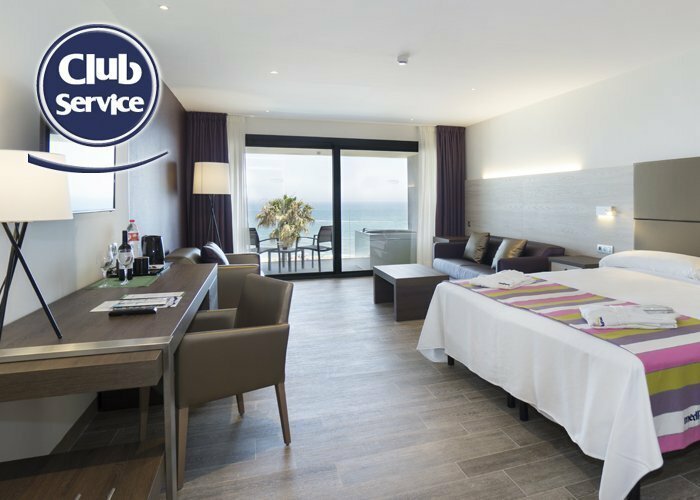 Each Junior Suite has a hot tub on the balcony allowing you to fully relax and enjoy the superb seafront location of your hotel room. 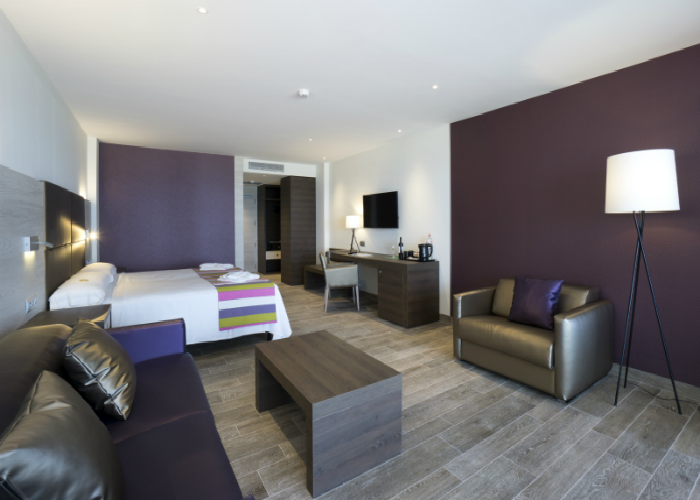 The Junior Suites are decorated in modern fresh colours with plenty of room for a family of four or a group of friends. 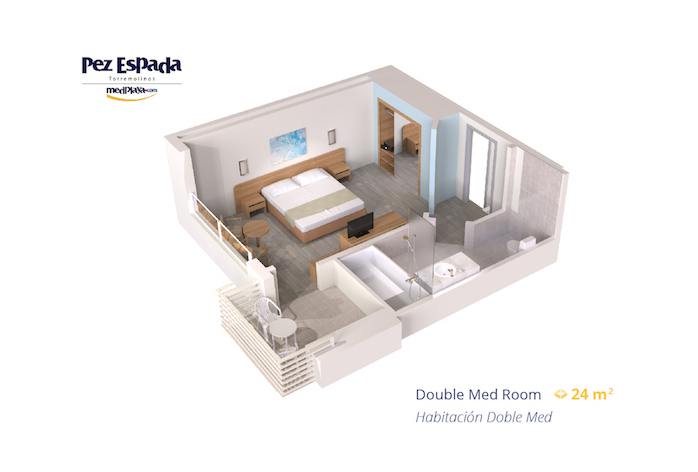 As well as a comfortable large bed (which offers the flexibility of converting to 2 twin beds if required) there is space for a sofa bed (pulls out to a double bed of 2m x 1.60) and relaxing chair and coffee table. 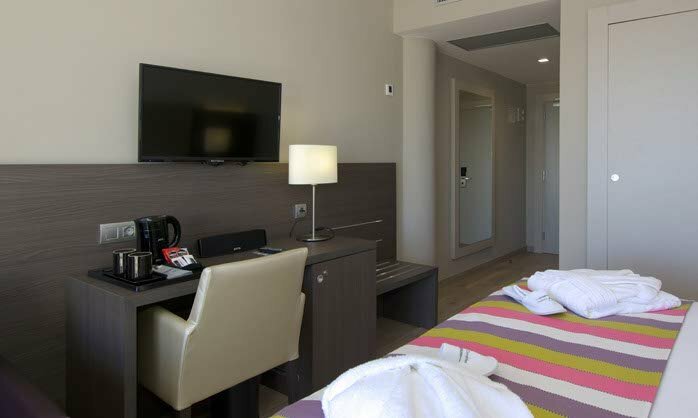 Junior Suites have the following facilities: Double or twin beds with duvet; Plasma TV; direct telephone; Free wifi. 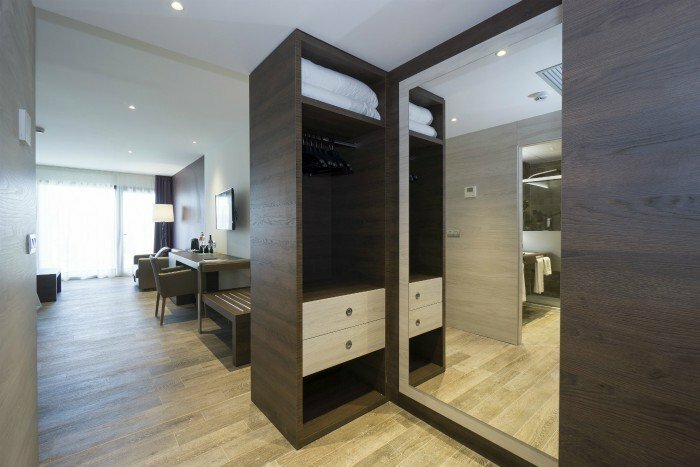 Modern and spacious bathrooms with a walk in shower; hairdryer; shaving mirror and a full complimentary toiletry selection. 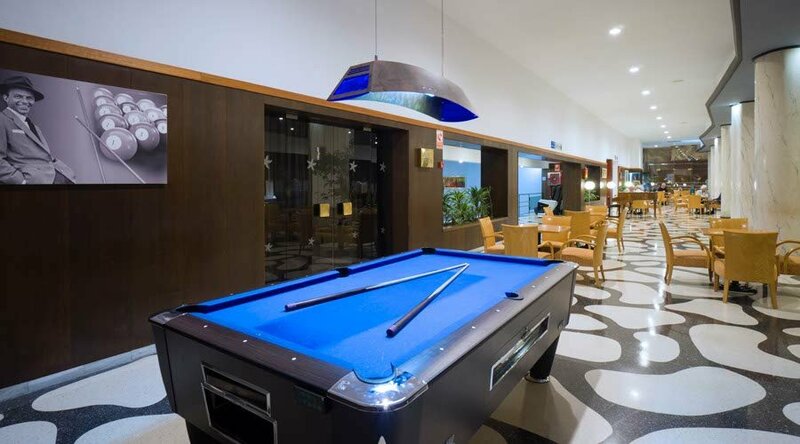 The Junior Suites also include the Club Services: fridge (mini bar) with welcome drinks, tea / coffee making facilities, bottle of wine, Club amenities, safety deposit box, bathrobe and slippers, pool towels to be collected in Reception (refundable deposit of 20,00 €). 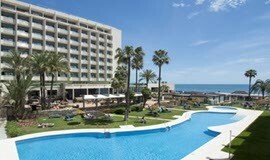 The Hotel Pez Espada is one of the most popular hotels of the Costa del Sol. 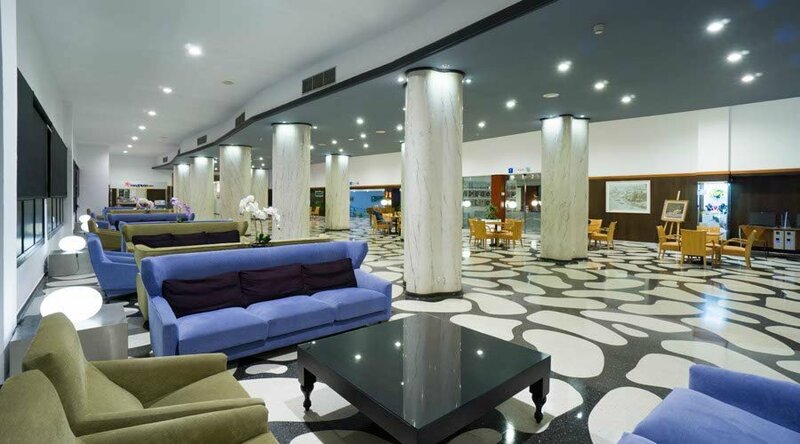 It is a four-star hotel with the perfect combination of a relaxed atmosphere with personal and attentive service. 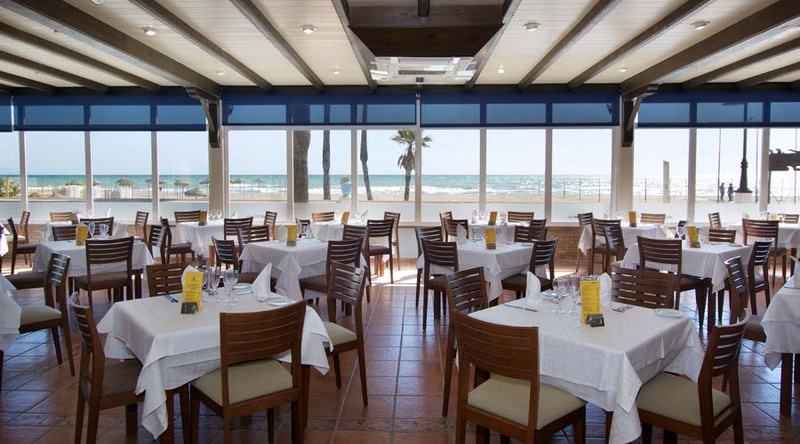 It has a privileged location right on the beach, next to the 'La Carihuela' area, which is famous for having the best seafood restaurants in Torremolinos and the entire area. 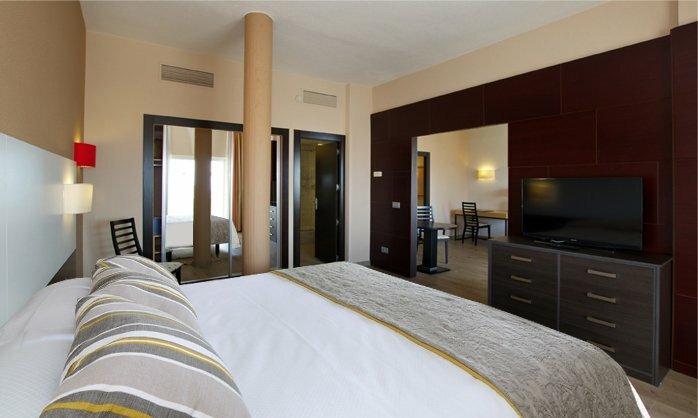 The hotel has standard rooms, Club rooms, Suites and Junior Suites, all of which are very well-appointed. 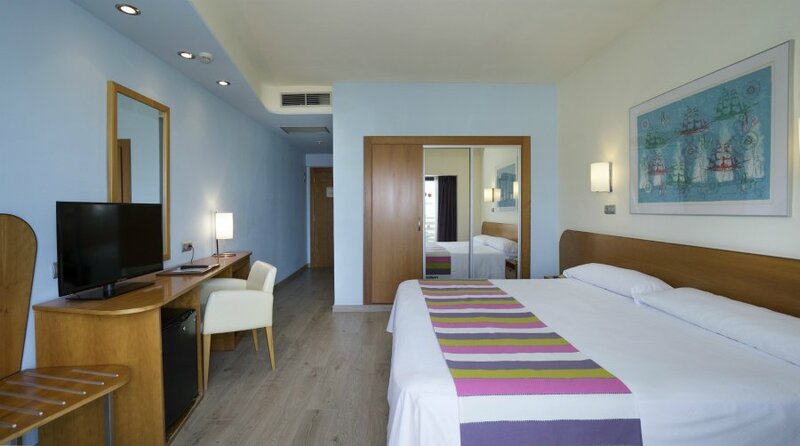 Our Club rooms and Junior Suites provide an extra level of comfort and services. 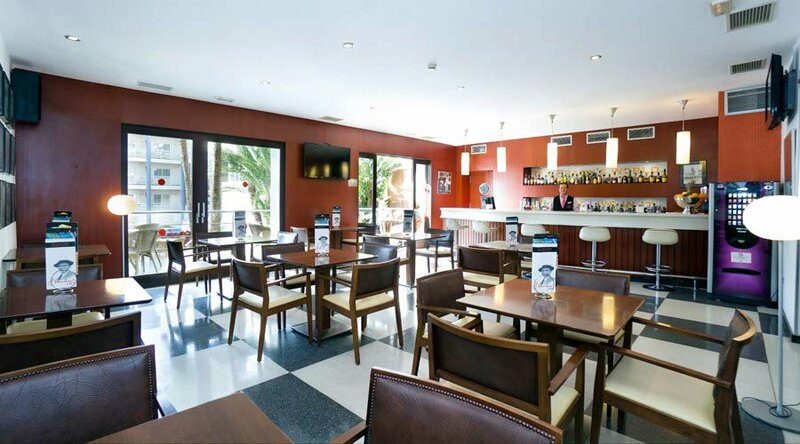 Free Premium Wifi available throughout the hotel. 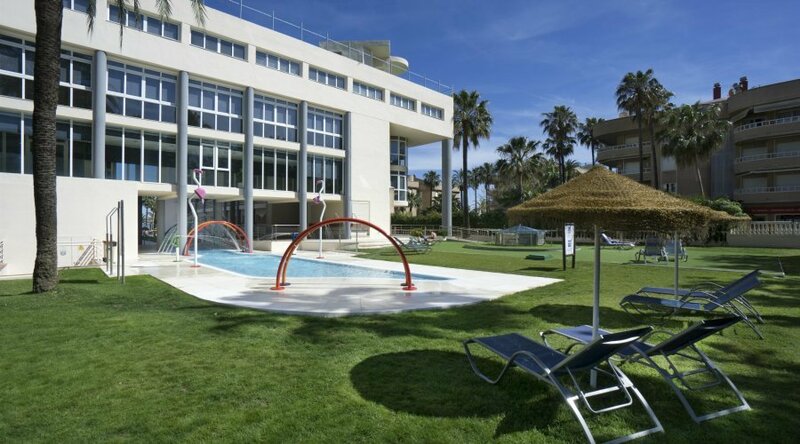 The hotel has a swimming pool area divided into two parts of the garden. 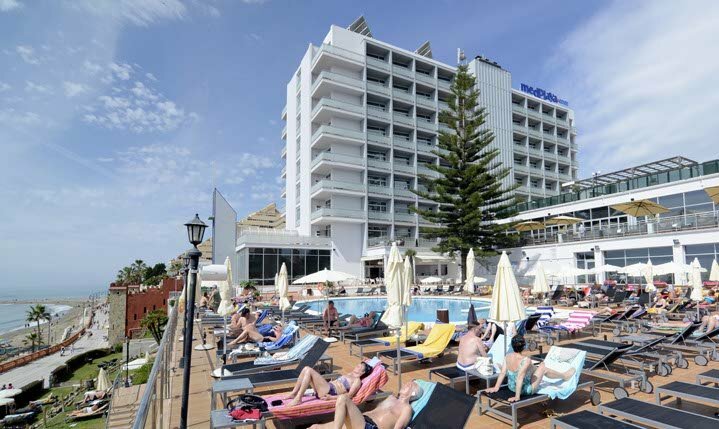 The main pool is set amongst lovely gardens leading out to the seafront, and the upper pool is also surrounded by a garden area but offers some extra fun with brightly coloured sprays and showers to make cooling off more fun, especially for children. 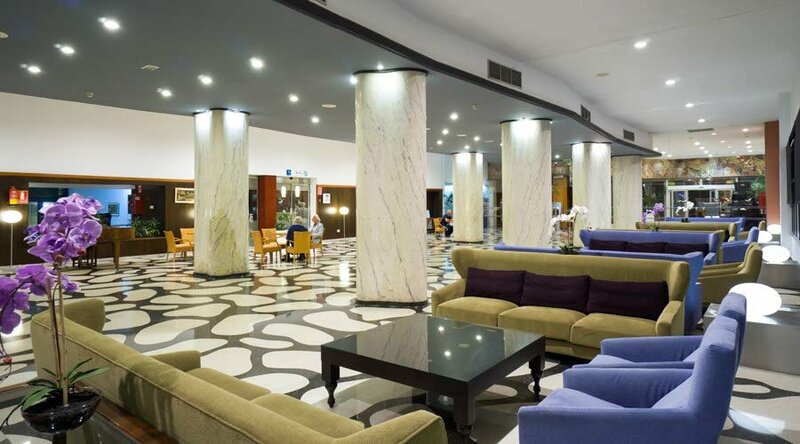 Our dedicated and attentive staff will provide you with an unforgettable service throughout your entire stay. 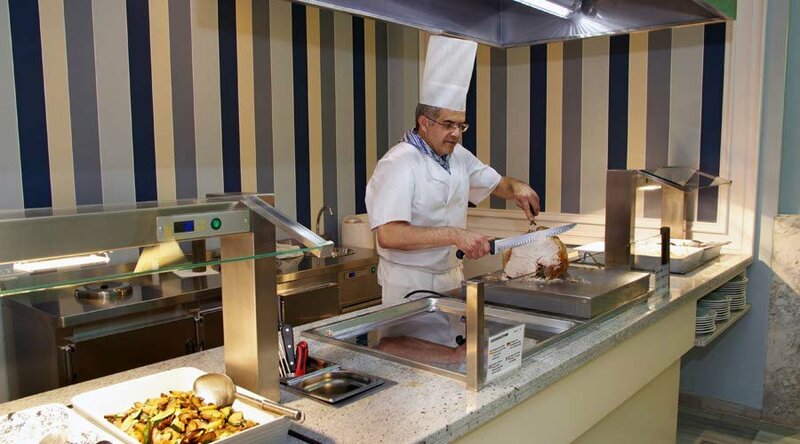 Our restaurant offers a buffet-style service with a varied cuisine. 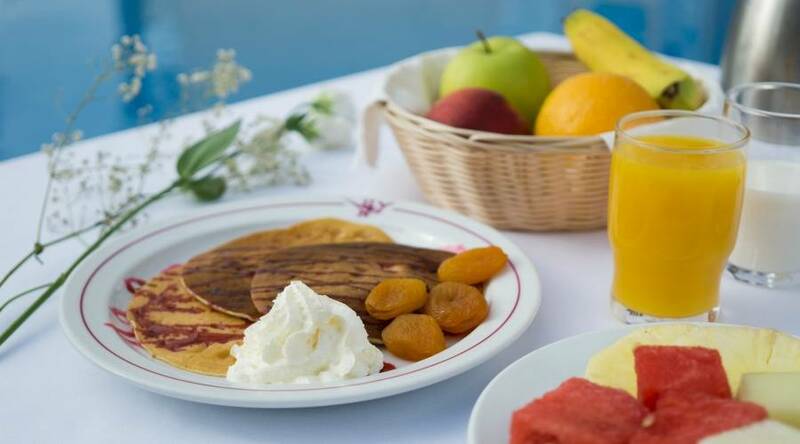 You can also enjoy our snack bar “Frankie’s Café”, the large garden. 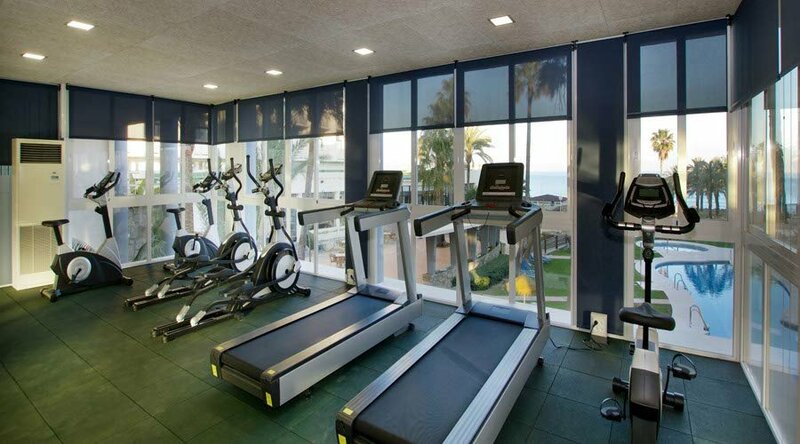 Torremolinos offers a wide variety of different cultural and athletic activities. 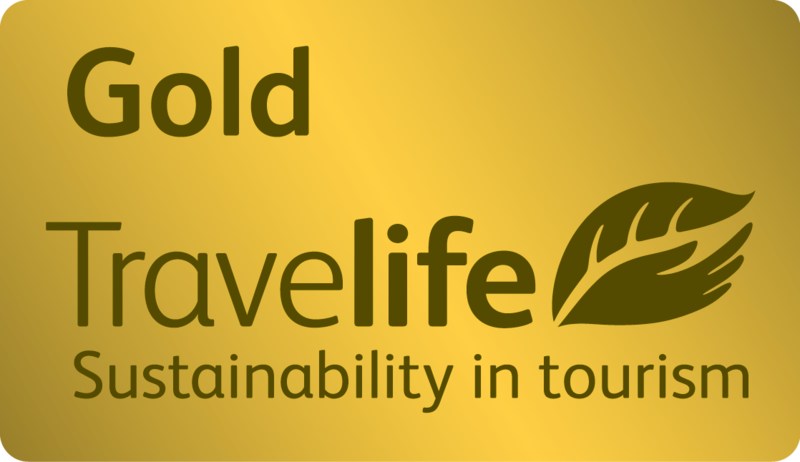 This city continues to be a point of reference for tourists from all over the world. • Main floor is handicap accessible. 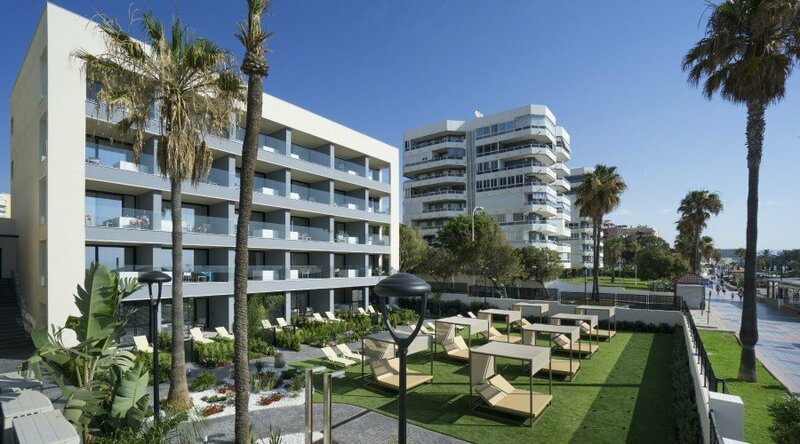 • Large tropical garden (5.000 m2). 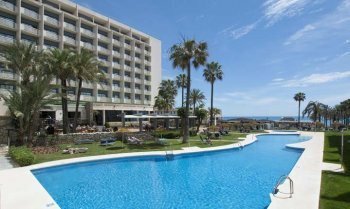 • Two outdoor swimming pools. 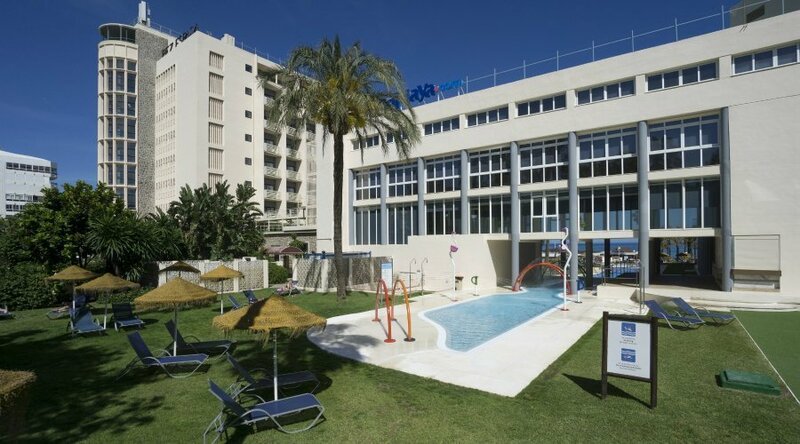 Outdoor pool for children. 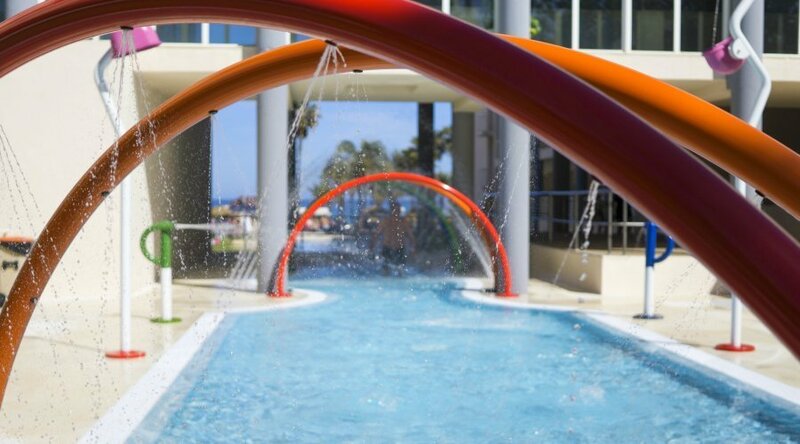 • Water sports can be practiced next to the hotel. • Golf course less than 5 kilometres away. 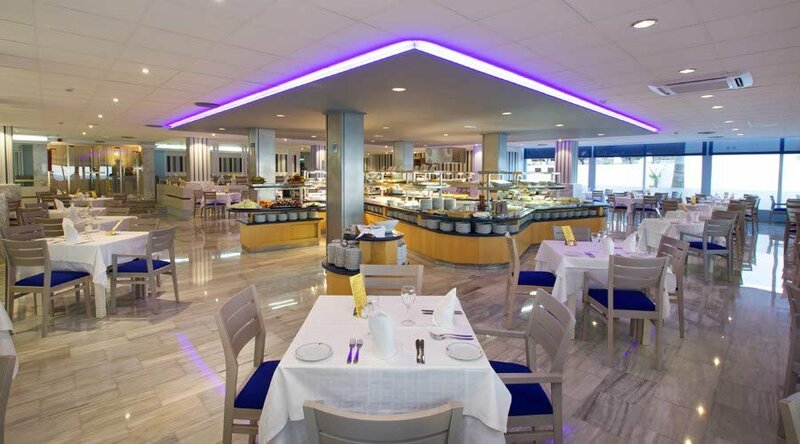 Our dining room offers a buffet-style service, where you will find a wide variety of Mediterranean and continental dishes to choose from. 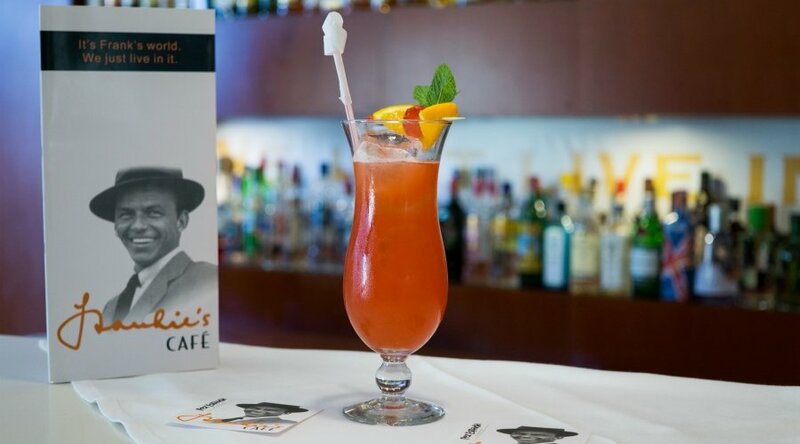 The hotel also has a snack-bar called ‘Frankie’s Café’, where all kinds of beverages and sandwiches are served. • Optional safe deposit box. 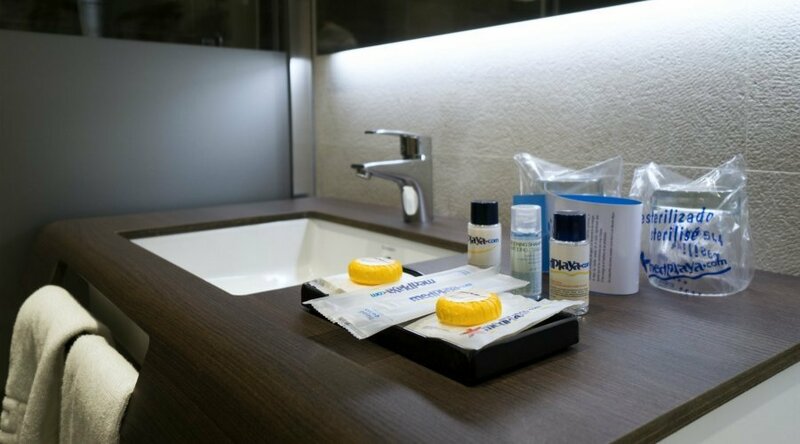 • Welcome pack in bathroom. 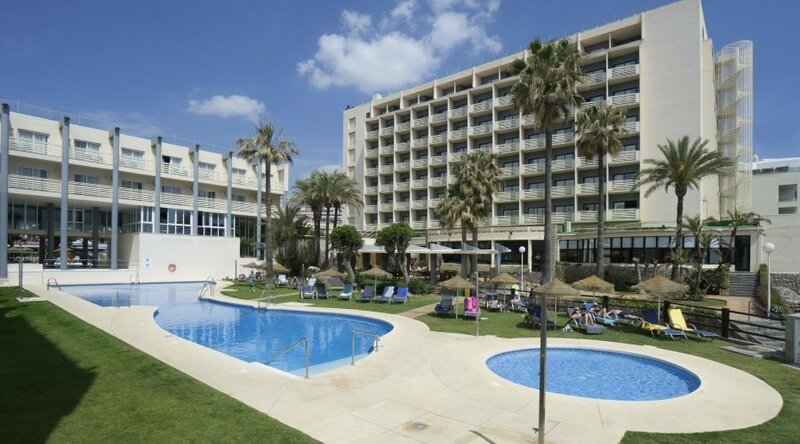 • Right next to the hotel. Private and outdoors. 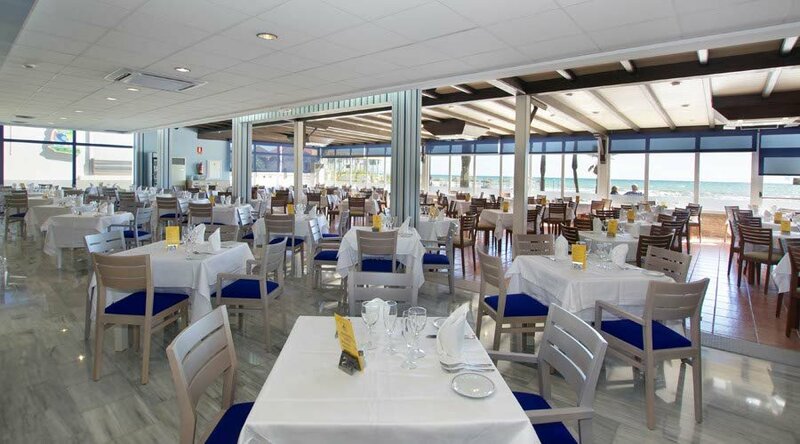 • Dress Code: Entry to the restaurant in bathing suits and sportswear during dinner is not permitted - Gentlemen are required to wear long trousers. 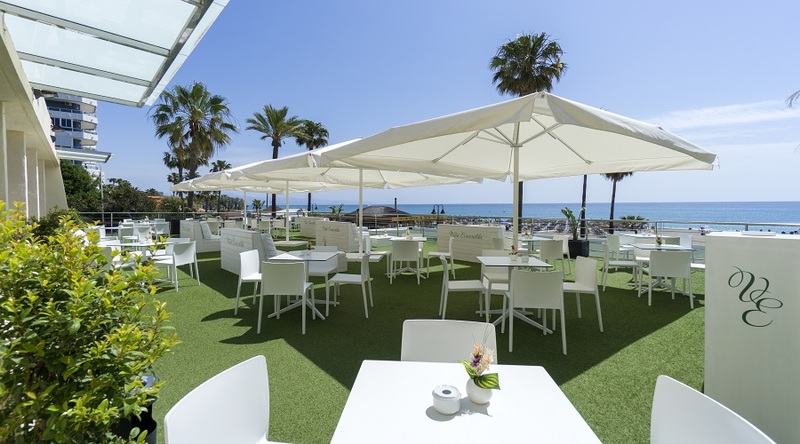 • In summer you can enjoy the Bar-Snack "Frankie's Café", next to the pool. 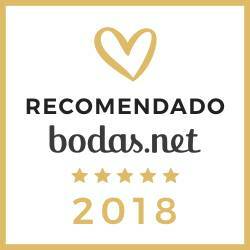 • Hair salon / Barber.